- Gildan® Youth 6.0 Ounce Ultra Cotton® T-Shirt. - Same as the 2000, in youth sizes. - CPSIA tracking label compliant. - Transitioning to side seam in 2019. 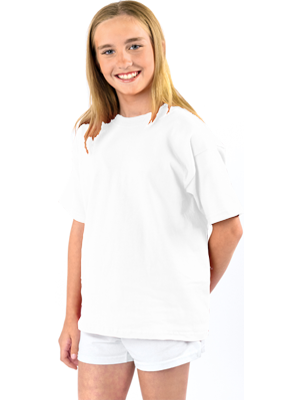 Gildan® Youth 6.0 Ounce Ultra Cotton® T-Shirt. Same as the 2000, in youth sizes. 6 ounce, 100% cotton pre-shrunk jersey knit. Double stitched seamless collar, taped neck and shoulders. Quarter-turned body. Double needle sleeve and bottom hems. Classic fit. Tear away label. CPSIA tracking label compliant. Transitioning to side seam in 2019. Youth Sizes XS-XL: Neutrals: White, Natural. Heathers: Ash Grey (99/1), Sport Grey (90/10). Colors: Black, Cardinal Red, Carolina Blue, Charcoal, Cherry Red, Daisy, Dark Chocolate, Forest Green, Gold, Heliconia, Indigo Blue, Iris, Irish Green, Jade Dome, Kelly Green, Light Blue, Light Pink, Lime, Maroon, Mint Green, Navy, Orange, Prepared for Dye, Purple, Red, Royal, Safety Green (50/50)**, S. Orange (50/50), Safety Pink (50/50), Sand, Sapphire, T. Orange. **ANSI/ISEA 107-2010 High Visibility certified for use as background material.